Amsterdam Airport is one of the main airports in Europe with flights worldwide. Official name of Amsterdam Airport is “Schiphol”. Allmost 58 million passengers passed through the airport in 2015. Schiphol has six runways and is the primary hub for KLM. The airport has 1 terminal building with 3 departure halls and 4 arrival halls. Location of Schiphol Airport is 15km from the city centre. Schiphol Plaza is the shopping centre before customs. All passengers arriving with the train go from the platforms into Schiphol Plaza. In the Plaza are shops, restaurants, cafe’s and a train ticket office. From Schiphol Plaza passengers can walk to the departure- and arriving halls of Schiphol Airport or to the parking areas outside. Cheapest way is to drive your car at a parking place near Schiphol (5 minutes driving). Another economic option is to park your car at the Long-Term Parking (Smart Parking) which is more closeby. A shuttle bus operates between P3 Long-Term Parking and the airport. More expensive is P6 Valet Parking located at Schiphol-Centre in front of the terminal. Schiphol Airport is connected 24h/day with Amsterdam Central Station. The train is the fastest transportation to the center of Amsterdam. Between the airport and Central Station, every hour leave 4-7 trains. Only at night (1.45, 2.45, 3.45, 4.45) there is one train every hour. The travel time is 13-18 minutes. Usually there are no stops between. On the floor of Amsterdam Airport are signs to the official taxi stand. Beware of people in the arrival hall and Schiphol Plaza who want to take you to their car. 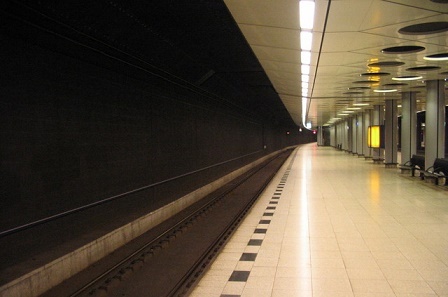 The train from Schiphol Airport to station Zuid takes 8 minutes and to station RAI 10 minutes. The Zuidas (South axis) is the financial business district in South Amsterdam. RAI is a large exhibition and convention centre next to the Zuidas. The Thalys highspeed train connects Schiphol Airport via Rotterdam with Antwerp, Brussels and Paris Gare du Nord. Travel time to Paris is 3 hours and 4 minutes. Seat reservation has been required. The IC/ICE trains connects Schiphol with cities in Germany. The fast train to Frankfurt takes 4 hours and 15 minutes. The direct train to Berlin takes 6 hours and 29 minutes. There is no metro line to the airport; the railway connects the airport with Amsterdam city 24h/day.